In case of liner material with a width less than 24 mm, the label roll has to be guided by additional margin stops centered to the ribbon to achieve an accurate imprint. Kits are available on request. White backlight provides optimum readability. Depending on the orientation of assembly, the display can be rotated in steps of 90°. allows simple, interactive menu control. Only applicable functions are displayed by the day and night design. In conjunction with the graphic display, navigation is made easy to understand. Three-part tightening axles allows the ribbon to be exchanged quickly and easily. The applicator is attached to hinge pins and can be easily removed for maintenance. 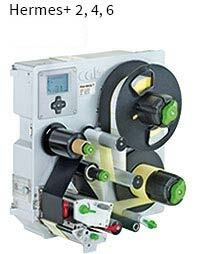 After inserting a new label roll, print positioning occurs automatically after few labels. The reference value remains even when the device is switched off. To be exchanged in few steps. Adjustments and settings are easy to make. in case labels are printed only partially. 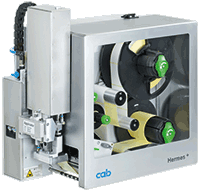 Along blank areas, the print head is lifted and ribbon feed interrupts while label feed continues. The swing lever and the integral brake enable labels to be unwound with constant tension. 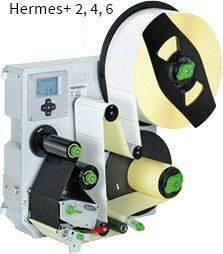 After all labels have been demanded, the liner of the label roll is fully rewound. The tightening axle allows the roll to be removed easily. 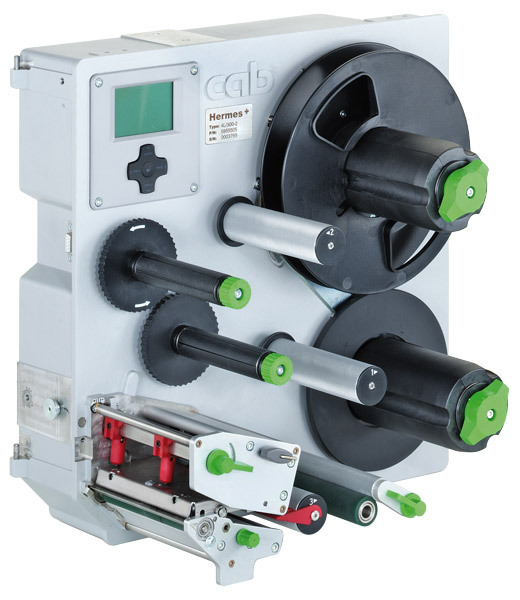 The ball bearing transport rollers ensure highly accurate printing and a precise feed. 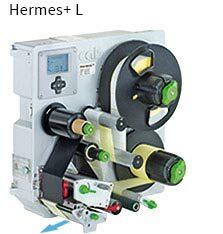 All Hermes+ devices with applicators are provided as left hand or right hand version. all inputs and outputs are galvanically isolated and protected from reverse polarity. In addition, outputs are short circuit protected. In conjunction with an ON/OFF valve plugged in, it allows compressed air supply to be interrupted in the event of danger. In addition to the display, it indicates the printer status. Delivery includes a connecting cable and material to assemble to the chassis or the bracket. For fully-automated print and apply processes in production lines. 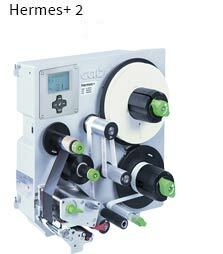 In case of carrier material with a width less than 24 mm the label roll has to be guided by additional margin stops centered to the ribbon to achieve accuracy of impression. Kits are available on request. Which accessory is standard or option for which Hermes+ device you can find in accessories overview in Hermes+ product catalog. If the operation panel is not accessible after printer installation, an external one can be additionally connected. A port to insert a CompactFlash Type I memory card as well as a USB host interface are also in place. to connect to Hermes+. In case a product has been detached, e.g. on a conveyor belt, labeling is started. to connect to a front side applicator, vacuum belt applicator or air jet box. In case a product has been detached, e.g. on a conveyor belt, labeling is started. In addition to the display, it indicates the printer status. Delivery includes a connecting cable and material to assemble to the chassis or the bracket. to adapt the 15 pin plug of Hermes A to the 25 pin plug of Hermes+. 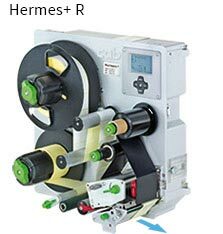 The Hermes+ have been designed for automatic printing and labeling in production lines. 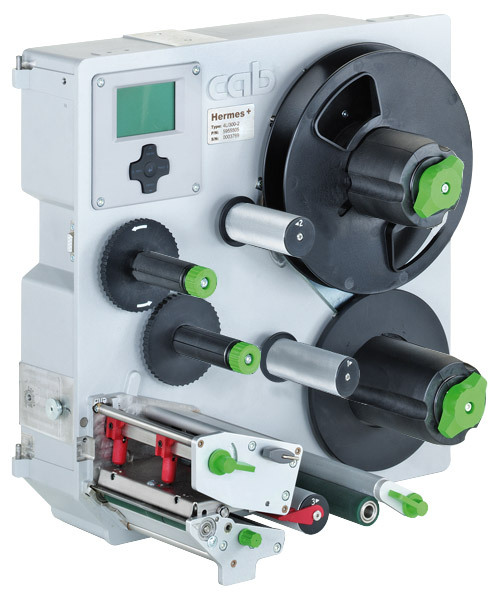 Various applicators are provided to roll, blow or tamp labels on products or packaging. The cylinder and the guide are protected by a cover as standard. Protective covers adapted to the product jig are offered for labeling workstations. Supporting air, intake air and stroke speed are all adjustable. Monitoring is via sensors. Applicators for small and large labels; Label heights from 4 to 250 mm and label widths from 4 to 174 mm can be processed. 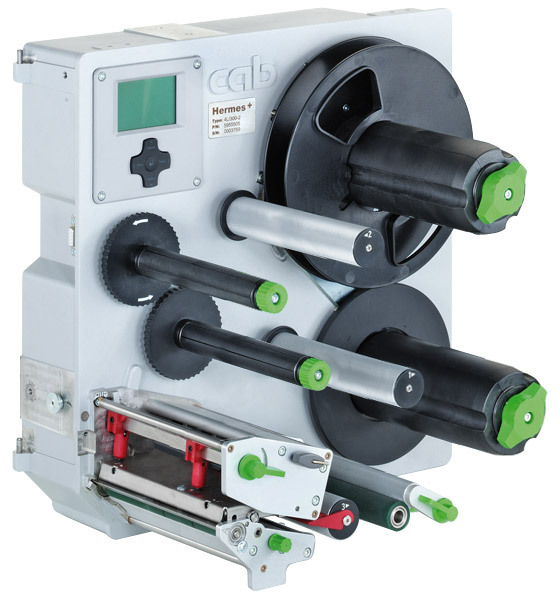 Access to the print mechanics in case of material exchange or maintenance is quick and easy. By its installation, the pressure of the stroke cylinder contacting the product is reduced. to install Hermes+ on a desk or in a production line; provided as left hand and right hand versions. The size of the mounting foot can be adapted to the application. The labeling system is assembled to the adapter plate. It may also be assembled with the adapter plate to the profile directly in the production line. They help to install Hermes+ in a production line. Thanks to the adjustment options, Hermes+ can be positioned in three axes to the product to be labeled. Pivoting is also possible. Preferred use is with applications in different production lines. The mobile floor stand can be aligned with adjustable feet at the place of application. Preferred use is with applications in which the heights and depths of the labeling position have to be changed frequently. By means of the toothed rack construction, Hermes+ can be arranged in x and z direction to the product. Applicators allow the labels to be rolled, blown or tamped on a product or packaging. In following PDF you can find all important support links to Hermes+ in one document.